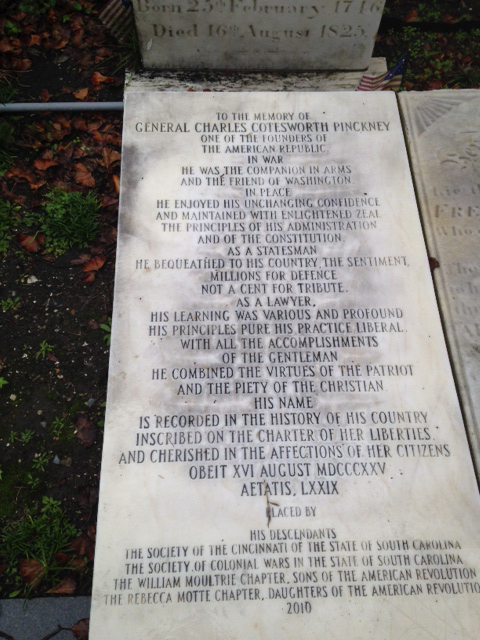 Charles Cotesworth Pinckney, a Future signer of the U.S. Constitution, was born in Charles Town. 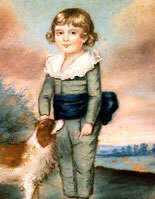 He was the eldest son of Charles and Eliza Pinckney. Seven years later, he accompanied his father, who had been appointed colonial agent for South Carolina, to England. As a result, Cotesworth enjoyed a European education. He received tutoring in London, attended several preparatory schools, and went on to Christ Church College, Oxford, and graduated in 1764. Pinckney next pursued legal training at London’s Middle Temple. He was accepted for admission into the English bar in 1769. He then spent part of a year touring Europe and studying chemistry, military science, and botany under leading authorities. In late 1769 Pinckney sailed home. He entered private practice in South Carolina and was elected to the provincial assembly. In 1773 he acted as attorney general in the colony. In 1775 he was a supporter of the patriot cause and was elected to the provincial congress. The next year he was elected to the local committee of safety and made chairman of a committee that drew up a plan for the interim government of South Carolina. When hostilities broke out, Pinckney, who had been a royal militia officer since 1769, pursued a full-time military calling and joined the First South Carolina Regiment as a captain. He rose to the rank of colonel and fought in the South in defense of Charleston and at the Battles of Brandywine, PA, and Germantown, PA. 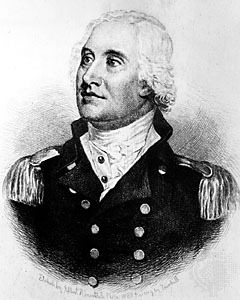 He commanded a regiment in the campaign against the British in the Floridas in 1778 and at the siege of Savannah. When Charleston fell in 1780, he was taken prisoner and held until 1782. The following year, he was discharged as a brevet brigadier general. After the war, Pinckney resumed his legal practice and the management of estates in the Charleston area but found time to continue his public service, which during the war had included tours in the lower house of the state legislature (1778 and 1782) and the senate (1779). Pinckney was one of the leaders at the Constitutional Convention. He was present at all the sessions, and strongly advocated for a powerful national government. He proposed that senators should serve without pay, but that idea was not adopted, but he exerted influence in such matters as the power of the Senate to ratify treaties and the compromise that was reached concerning abolition of the international slave trade. When Pinckney arrived back in the United States in 1798, he found the country preparing for war with France. That year, he was appointed as a major general in command of American forces in the South and served in that capacity until 1800, when the threat of war ended. That year, he represented the Federalists as Vice-Presidential candidate, and in 1804 and 1808 as the Presidential nominee, but was defeated on all three occasions. During the later period of his life, Pinckney enjoyed his Belmont estate and Charleston high society. He was twice married; first to Sarah Middleton in 1773 and after her death to Mary Stead in 1786. He died in Charleston in 1825 at the age of 79 and was interred there in the cemetery at St. Michael’s Episcopal Church. This entry was posted in Born Today, History - American, History - Charleston, History - South Carolina, Revolutionary Charleston, Today In Charleston History, Today In History and tagged Charles Cotesworth Pinckney, Eliza Lucas Pinckney. Bookmark the permalink.